NO ONE BEHIND YOU,JUST EXTENSIVE LAWN & GARDENS!! ARGUABLY ONE OF THE BEST LOCATIONS IN THIS COMPLEX!! WALK off your PRIV(18 x 14) deck right onto lawn, except YOU DON'T have to maintain it! If you're looking for LIKE NEW WITHOUT the GST then this is the one! 9 FT CEILINGS on the MAIN FLR,LARGE windows THROUGHOUT,GRANITE counters w/ UNDERMOUNTED SINKS,STAINLESS STEEL appliances & LAMINATE flrs, LOADS of POT LITES. 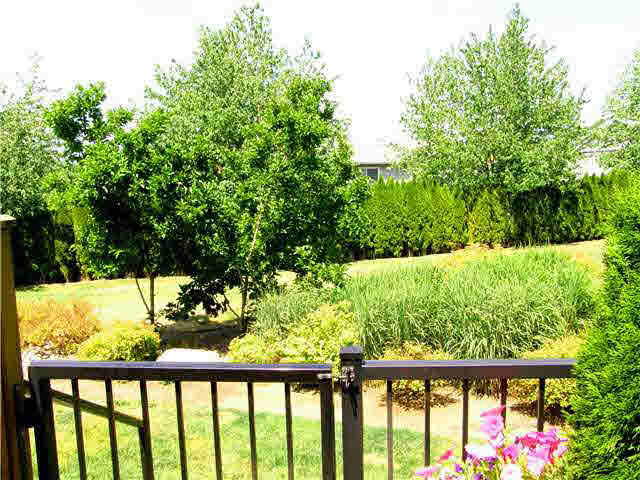 Featuring over 1400 sq ft w/3 bedrooms, 2 1/2 bathrooms (mn flr powder room)There is a GAS F/P in the LVGRM,a GAS STOVE in the KITCHEN and EVEN a GAS BBQ QUICK CONNECT on the rear deck!LAUNDRY is upstairs.The (40 x 10) TANDEM DBLE garage will easily handle 2 larger vehicles & TWO DOGS ALLOWED. OPEN JULY 19th (2-4)!